Roasted Smashed Potatoes smothered in garlic herb butter and Parmesan are one of the most delicious sides on the planet and SO easy! Garlic Smashed Potatoes may look impressive but are one of the easiest sides you will ever make – and you don’t even have to peel any potatoes! They are salty crispy on the outside, buttery tender on the inside and intoxicatingly delicious all over. These Smashed Red Potatoes are the perfect side to any meal or an irresistible finger party food. Aside from their YUM factor, these Smashed Potatoes get major points because you can prep them almost entirely ahead of time, perfect for entertaining and holidays. Add potatoes to a large pot and fill with water to about 2-inches above potatoes. Cover and bring to a boil, then reduce heat to medium, and continue to cook (covered) for 25 minutes or until potatoes are fork tender. Meanwhile, preheat oven to 425 degrees F and lightly grease a large baking sheet with sides. Drain and rinse potatoes in cool water. Pat dry (for crispy skins) and add potatoes to a large microwave-safe bowl. Drizzle potatoes with 1 tablespoons olive oil and ¼ teaspoon salt. Stir to evenly coat then transfer potatoes to baking sheet, evenly spaced apart. Using a potato masher, fork or back of a glass, gently smash the potatoes to about ½” thickness. *MAKE AHEAD: If making ahead, stop at this point, let potatoes cool completely and wrap tightly in plastic wrap; refrigerate. To the same bowl you tossed the potatoes in oil (don’t wipe out) add butter and melt in the microwave. Stir in ¼ teaspoon salt and all remaining seasonings. Drizzle potatoes evenly with butter mixture. If you have extra, wait a few minutes for the potatoes to absorb the butter then coat again. Bake potatoes at 425 degrees F for 30-40 minutes (depending on size) or until deeply golden. Add Parmesan and continue to bake until melted, about 2 minutes. Garnish with chives and serve immediately. I stick with potatoes about the size of a golf ball. You can use smaller or larger potatoes and adjust the cooking time accordingly – and your expectations. Small potatoes will emerge crispier all over because there is a greater ratio of crispy skin to fluffy inside. Larger potatoes will still get crispy, but have a larger ratio of fluffy inside to crispy skin. Both are delicious – just different! Follow the recipe through flattening the potatoes. Let the potatoes cool completely, then cover the pan tightly with foil, or better yet, wrap the entire tray in plastic wrap a couple times. You can also grate the Parmesan cheese and make the herb butter ahead of time and refrigerate. The herb butter will harden in the refrigerator, so simply microwave it when ready to use. 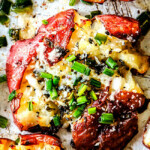 Now all that’s left to complete your crispy Smashed Red Potatoes is to drizzle on the butter and bake!